At Knockout Pest Control, we not only solve your pest problems, we keep them solved. We are in your corner with state-of-the-art insect extermination, bug treatments and pest removal methodologies. We are New York’s experts in both residential and commercial pest control. This is in response to Knockout"s reply to my review. There were never many people going in and out of my apartment. Before, during, and after the extermination, the only person that came into my apartment was your worker. And by the way, I did not call the police so I don"t know how you can write that they called you. If I had a video, photo, or audio of the theft by your employee, they would have been notified. I would base my life on the fact the your employee STOLE my jewelry! The technician stole my jewelry. I had to leave my home on 3 different occasions and did not check my jewelry until a month later. I am basically bedridden and do not usually leave my home. Half of my jewelry was stolen. I called and complained but he claims he did not take anything. I would not allow this company, which was sent by my building management, to ever come in my home again! There is no evidence to support this review. We did get a call from this tenant. We worked with building management. We suggested she call the police. The police did call us, but never interviewed any of our office or technical staff. There were many other people in her apartment between the time we provided service and the time she reported her jewelry missing. Our technician has been with our company more than 10 years and is an exemplary employee with only accolades from clients as evidence of many reviews on our company web site in addition to Angie’s List reviews. Excellent service, came promptly, price was amazing! Would definitely recommend this company. Great service! Really hardworking and friendly technician. Really kind and helpful customer service! Great service. Very professional. Highly recommend. **** four stars very professional and knowable great job, would call them again. Excellent service. Before, during and after! Good service!! Problem taken care of! The technician arrived within the stated timeframe. He was very friendly and knowlegdable. He applied the appropriate chemicals in the appropriate places and my pest problem seems to be over. I would recommend Knockout to anyone needing the services they provide. They sprayed for water bug roaches. They did fine. Enrico was great. He was on time, patient and very informative.I feel very comfortable and confident my mice issue will be taken care of. I had what I thought was a rotted board in my living room floor and suspected termites. I did not find any evidence of them in my basement but I called Knockout to be sure. Well they found them I did not look near as carefully as they did. I went ahead and got the treatment and hopefully in 2 years the termites will be completely gone. They explained the life cycle of the termites and how their product works to kill the nest. I was very happy with their service and would call them again if need be. TonyF. Well first, the people who answer the phones and schedule the appointments are extremely helpful and a pleasure to speak to. The technicians who come to the house are professional and knowledgeable and I have good confidence that they will solve my problem. I understand that these things take time. I feel lucky that I chose Knockout for my problem. Knockout is very responsive and professional. Staff is very courteous and mindful of customer's needs... safeguarding household pets. Very professional and through. Would recommend. Excellent and professional service every time! have the termite service for years, had a new problem with ants, Knockout came No more ants. Very happy with service from Knockout - long time customer for Termite Protection and recently extermination of yellow jackets outside house. Was very happy with the service and all the peo0le i cam in contact with at ‘nockout. Only wish there was some type of warranty or guarantee for the service. So far so good! Very professional and friendly, well-dressed pest technician. After about 4 days since treatment, I haven't seen any bug, and I had a pretty bad infestation, much to my surprise. Knockout seems to be quite legit so far, and I would highly recommend them. Their yearly plan is reasonably priced and I plan to continue to use them for my (hopefully decreasing) pest needs. It’s been three weeks so far so good. We're very happy with the job your technician did. He was on time and explained what he was going to do to get rid of the bees nest. He came back a second time to re apply and that did the trick. No more bees. The serviceman who came to take care of our bee infestation was very professional and knowledgeable. Just by looking and listening intently he found the nest (which was in a totally different place than we had assumed) and treated it. Haven't had the problem since. Great technition will definitely Recommend you guys! I am very pleased with their professionalism, expertise, courtesy, and rapid response. I have referred friends and will continue to do so. Service was wonderful knockout got rid of the ants!! We are very happy with knockout pest control. For years we have used their sentricon system for termite control, but recently we had a wasp infestation outside our front door. Not only did knockout solve our situation at the front door, they checked the entire outside of our house and found a second hive on our roof. They were thorough and very attentive. Thank you. I have been using Knockout's services for years. They always come promptly when I call and their service providers always do it with a smile. Fair, honest, hard working team of employees. The technician was very professional, patient and polite. He was very knowledgeable and answered each question in detail. I definitely appreciated that he explained everything he was doing and why it was beneficial. I’d gladly use your services again. Edwin, the installer was great , explained everything he was very professional. I have a 130 year old townhouse in NYC and have had various extermination needs over the years. 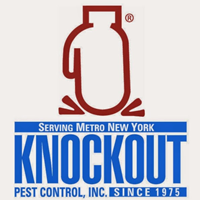 The ONLY people I call are Knockout Pest Control. Their service is fast, thorough, and professional. They fix the problem correctly the first time and are very accommodating with scheduling. I cannot recommend Knockout high enough! Alex was courteous and professional. Erin professionally facilitated the booking. Great job! We received very quick and efficient service! I would highly recommend this company!! I couldn't be happier with the service we received. The technician, Christian, was so friendly and courteous. We had a wasp nest that was very active. He made sure no one got stung and offered advice for us to follow to make sure we didn't get stung after he left. I would highly recommend Knockout to all! On time, very friendly, and most importantly, got rid of our pest problems in one shot! Great customer service/ technician was professional.